Do you dream of Egg, Dairy & Gluten-free waffles and french toast for breakfast? 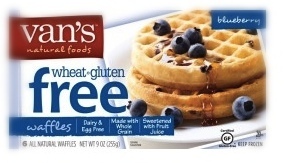 Dream no more; gluten free waffles and french toast sticks are now in reach, thanks to Van’s All Natural. We’ve partnered with Van’s to bring you a chance to win $25 worth of FREE COUPONS from Van’s All Natural! Our latest giveaway brings you one of our favorite Breakfast Foods, thanks to Van’s All Natural, makers of gltuen free waffles & french toast sticks. Pop them in the toaster for a couple minutes, and you’re met with warm, delicious waffles and french toast sticks that are sure to please the pickiest of gluten-free pallets! Check out their store locator here, and be sure to register for a chance to with $25 worth of FREE COUPONS below from Van’s All Natural today! You may not know it, but Van’s has been cooking up tasty, good-for-you waffles for almost a half century. It all started back in the 1970s when the Van Dam family opened a swinging waffle joint in Southern California. By the late 1980s, our groovy little beachside favorite had outgrown itself, and the Van Dam family decided it was time to bring their creations to a whole new group of customers—right in their local grocery stores. Since then, Van’s has evolved from a single waffle restaurant to one of the country’s most beloved frozen waffle and breakfast companies—but our philosophy hasn’t changed a bit. We’re a company that cares about what its customers eat. We value artisanal quality, cooking our products in small, minimally processed batches with always-fresh ingredients. Contest disclaimer: Van’s sent us free coupons to use to try their products prior to announcing this contest, though we were already big fans of Van’s before-hand! We are not compensated for this contest, and winners are selected randomly from Random.org. Winners will be notified within 72 hours from the contest ending. So many people have gluten allergies these days. I’d love to try these out. would love to try the blueberry… fingers crossed! I would love to try the French toast sticks! I would love to win, I love vans blueberry waffles! I would really like to win. I love the gluten free pancakes. I am interested in trying the blueberry waffles. I'm a waffle kind of girl. Power grains waffles sound awesome!